For those of you who wonder where and how to discover new labels, here is a tip: Browse on YOOX and The Outnet, and then pay attention to the tailored ads that start appearing in your news reading. It’s how I found Mikael Aghal! Mikael Aghal! A New York-based label of women’s clothes — ultra feminine dresses. This one captured my fancy and I cannot decide if it is chic or frumpy. Can it be both? Am I . . . slouching? The Photographer, without prompting, recognized a prairie aesthetic here but did not know what to call it. Fortunately, I was able to supply the words. It’s kind of Little House, I said. This dress is a dress but looks like a blouse and a skirt and therefore is instructive because . 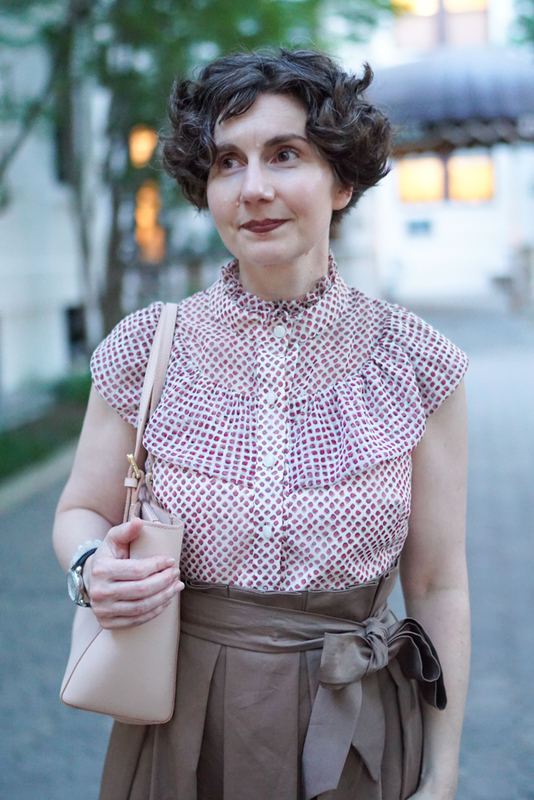 . . you could create this look with another blouse and skirt. 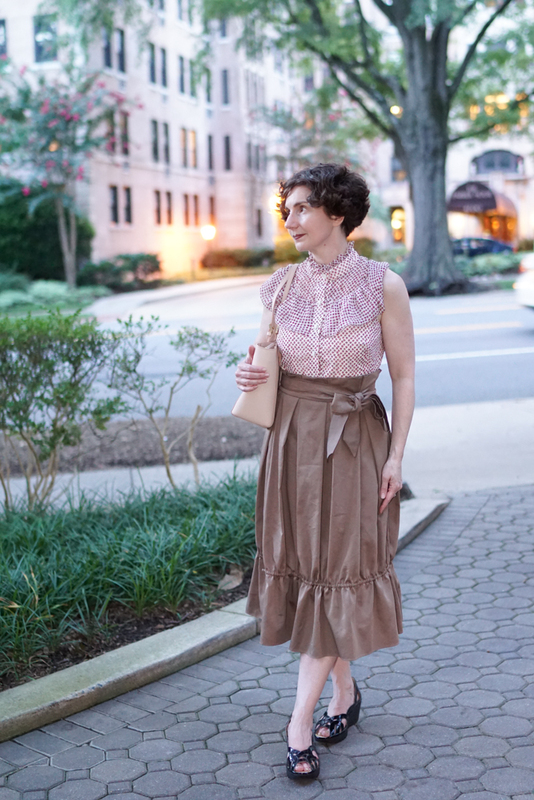 The paperbag waist is au courant and, in my opinion, more flattering on a skirt than on pants. All of those pleats flow more gracefully into a skirt. The gathered flounce at the hem — look above — is not a flounce at all. It’s a drawstring that an be tightly or loosely gathered to calibrate the volume of the skirt. Ingenious! A self belt defines this paper bag waist. I have tied the best bow/knot that I can. I think I need Fatima’s guidance on this. ** After several different key word searches, I cannot find any post discussing Prairie Fires, which I thought I had recommended. It’s a fascinating look at the mythology of the Great Plains, agricultural policy and geo-engineering, and the cruelty of under-regulated investment markets. The mortgage crisis of 2008 has parallels in the railroad boom of the 19th century. Also, be forewarned: Prairie Fires will make you think differently of Laura Ingalls Wilder and her books. + There are plenty of Mikael Aghal dresses with long sleeves on The Outnet, so look forward to fall. I like this one, but cannot decide if it is beautiful or hideo-marvelous. I have observed in myself a desire to be more covered up. I think it’s fascinating how I’m influenced without conscious choice by fashion trends. I chose a bathing suit with a high neck this season, and now I know why. I thought it was just becoming older, but it’s my response to this new trend. Anyway, I’m all for it! True, the paperbag waist does fit more naturally with a skirt. Too bad that bottom half of the dress isn’t an actual skirt. Drawstring bottom: clever innovation. 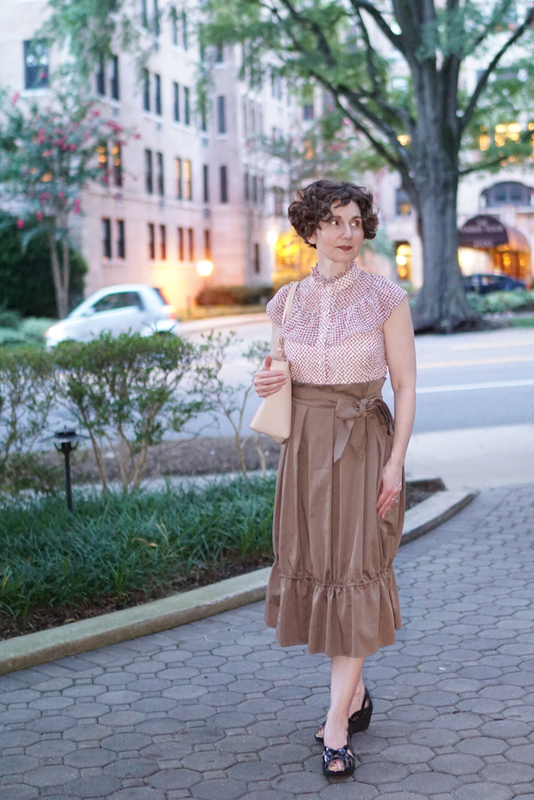 It’s chic — it might look frumpy on others but not on you. The posture and poise carry it. “Prairie Fires” sounds excellent, thank you for the recommendation! You also make a strong case for reserving bag waists for skirts; especially helpful to those of us who will never look their best in trousers. With the sheer top half and no sleeves, you’re still “showing” enough to qualify as feminine – and that bow! Love the Prairie reference, and will check out the book. Disclaimer: I was raised in the Midwest , I had a sunbonnet and my sister and I hauled our dog around in a red wagon pretending we were pioneers. I read “Prairie Fire” and liked it, but it does point out some of the slant that the Little House books presented. Wilder and her daughter/editor Lane recast her childhood with a decided philosophy that went heavy on individualism, and left out some of their more sorrowful times. The family did skip out on some debts, take public assistance, and scrape along with bare cupboards quite a bit. What really struck me from the book was that once Laura and family moved to Missouri, she never saw her Mother again. All the same, she created a strong female character that I admired. It’s too bad this is a dress because I think I would like the skirt without the blouse better. Together it’s a tad much for me. Maybe a tailored jacket over the ruffled top would suit me better. I do love the color of the skirt! I’m interested in the history/book recommendation, I love the skirt part of that dress, but MOSTLY I adore the term “hideo-marvelous.” Thou art a genius, Directrice. It has been over two weeks! Where art thou Directrice? Come back, all is forgiven . Jokes. I am sure that you are either super busy or on vacation. I look forward to your next tres amusant post. I came here wondering the same thing! Maybe it will turn into content… I would love an aggregated “daily quick mirror selfies with outfits actually worn to work during crunch time” post! Katie, “super busy” is the answer to your question. 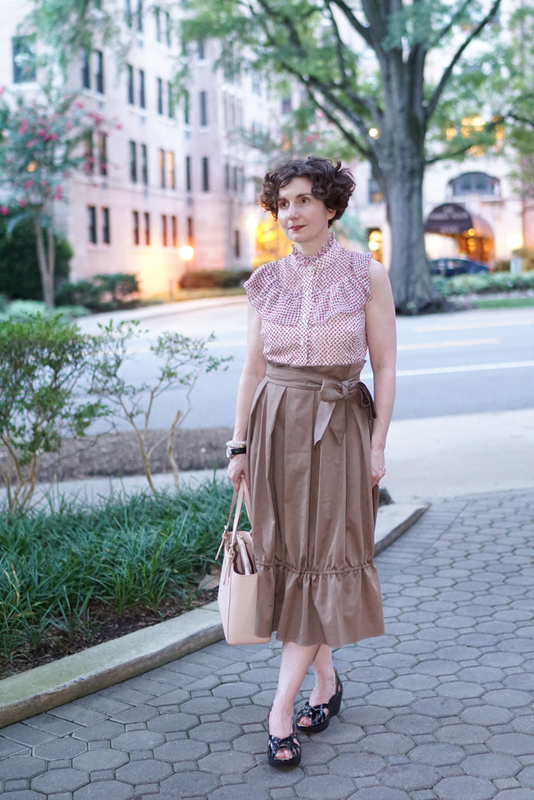 After a few wearing as-is, I would be tempted to separate this apparently-skirt-and-blouse in to two distinct pieces – they could still be worn together, of course, but each also in other outfits. A hem panel could be added to the blouse by the indefatigable Fatima, should it prove too short post-bisection.